Yesterday I had so much fun with the kids. 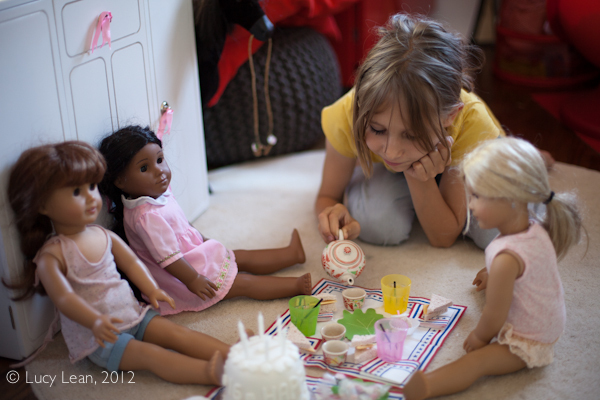 Minty is really into playing with her dollies at the moment so we all set about making a birthday tea for Primrose. 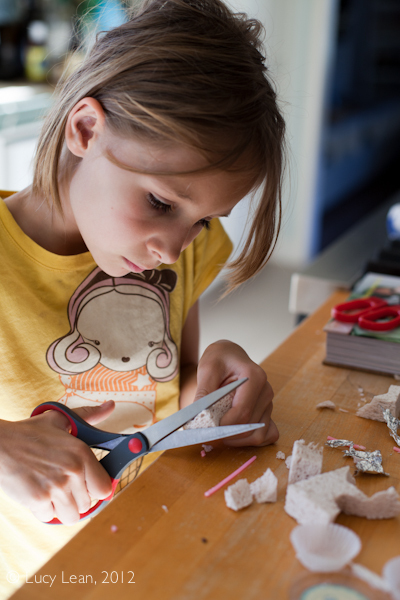 I wanted to help but I really wanted the kids to be creative and do most of the making. Anything miniature has always fascinated me and from the amount of time Minty spends drooling over the American Girl Doll catalogue she is the same. I set out to prove to her that she could make just as good, if not better, food for her dollies – at a fraction of the cost. 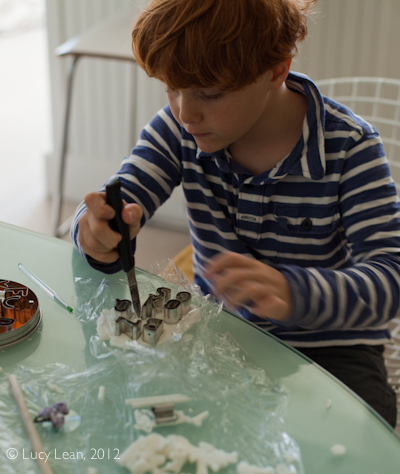 Rémy joined in the making – busy cutting out letters from fondant. 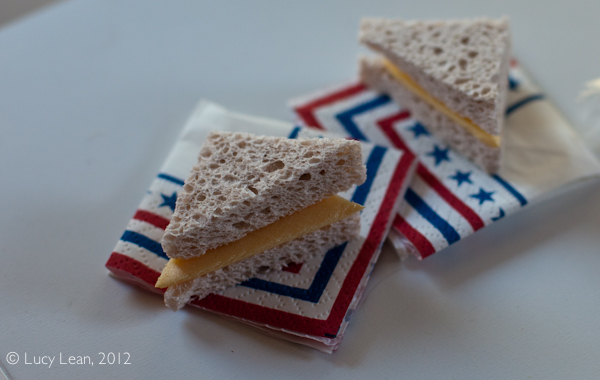 We made cheese sandwiches from a sponge and the yellow Styrofoam packaging from a box of ice cream cones. The mini napkins were just one quarter of a regular napkin that was then folded back up. 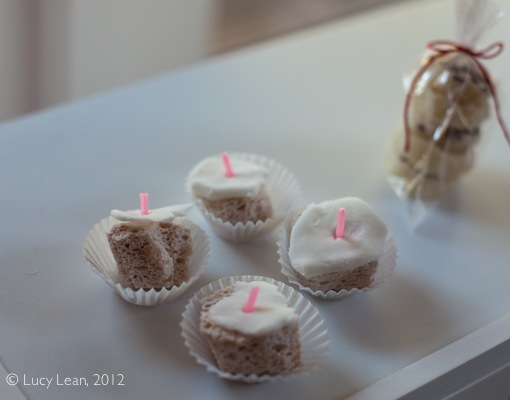 Minty made these dainty cupcakes using more of the sponge for the cake part and topping them with white fondant, a little pink candle cut down to size and the tiniest petit four paper cases. 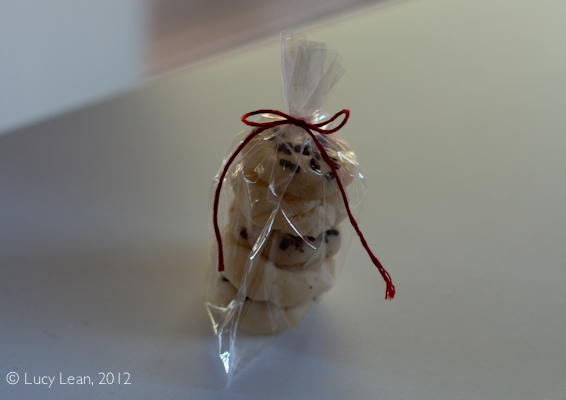 This little bag of chocolate chip and white sugar cookies were made from marzipan with some chocolate sprinkles and then placed in a tiny treat bag and tied with red string. 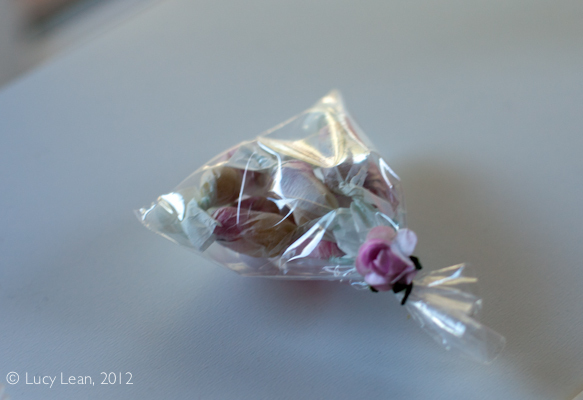 Minty made these dolly candies using wooden beads wrapped in white waxed papers and then placed in a tiny treat bag and tied with a pretty pink paper rose. Finally, we all made the birthday cake using an empty plastic pot (Trader Joe’s Parmesan cheese) that we inverted onto a disc wrapped in aluminum foil and covered the ‘cake’ in white fondant. We cut out lots and lots of tiny flowers and the letters HAPPY BIRTHDAY for around the sides which were glued in place using water brushed on with a fine paint brush. 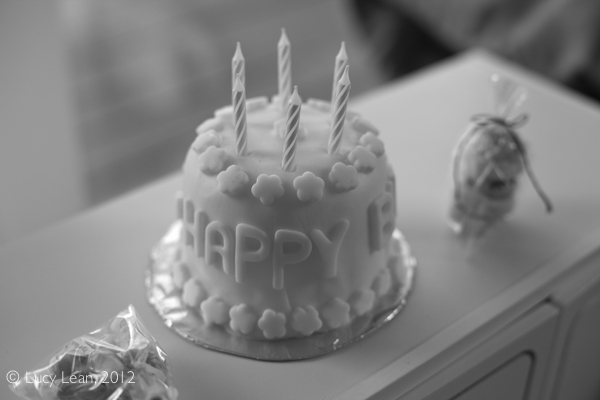 Finally we stuck 6 candles in the top which had been shortened a little using a sharp knife. The black plastic drinking straws were cocktail straws cut in half. 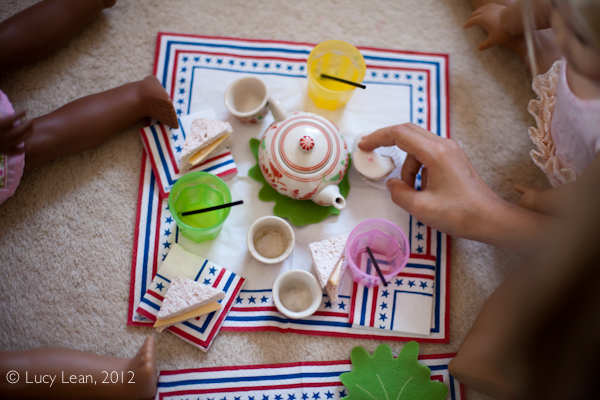 The adorable tea set was a gift from Annabelle, from one of her adventures to Cambodia, and the picnic blanket was a paper napkin covered with some fabric leaves that came in an IKEA playtime food set. 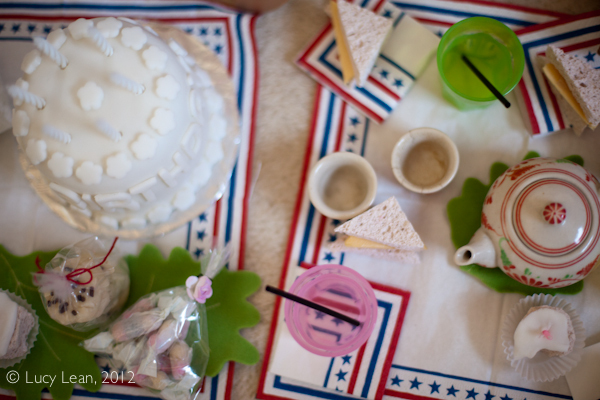 Most of the fun was in the making but then the party itself was fun too – and best of all all of the food will keep for the next time we decide it’s time for a birthday tea. 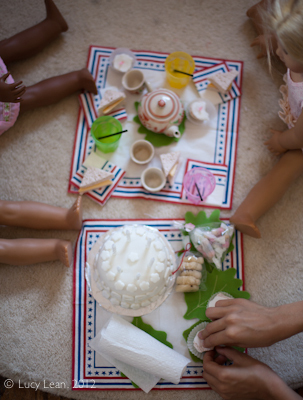 My dolls never got such fabulous parties! Minty’s dolls must’ve loved the fun! My birthday is in January. Can I book your kids now? So cute, Lucy! Super cute! I love this idea for when I have (hopefully have) a daughter someday. Too cute! What a fun little party! 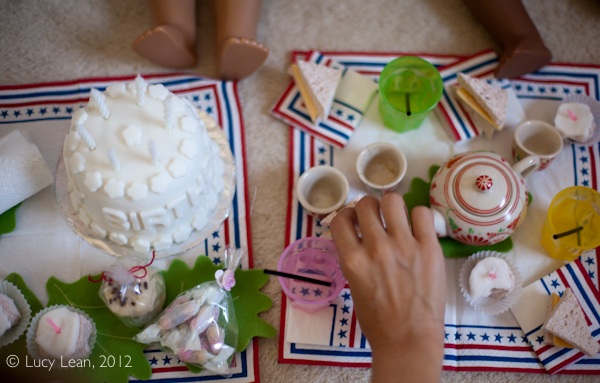 My siblings and I used to make mini food for teaparties with our grandma! I have always loved mini things too. This bring back good memories.